Provides tactile and oral stimulation for every sensory seeker. The alternating textures of this product act as a wearable hand fidget and offer instant calming to children in stressful and or meltdown situations. By simply engaging fingers across the top of the textures, this armband has been proven to increase concentration and reduce stress immediately. 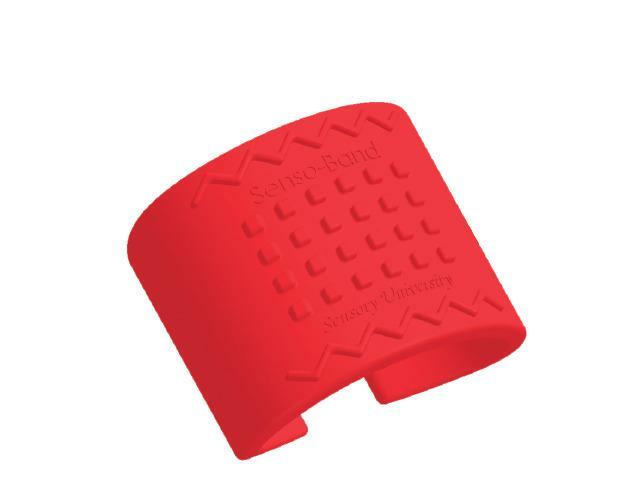 If having a wearable hand fidget was not helpful enough, the FDA approved BP, latex, and phthalate free Senso-Band material is chewable. Over 65 percent of sensory seekers not only seek tactile stimulation but oral as well. This device will give your child the one-two punch necessary in their daily sensory diet to overcome challenges both at home and at school. Color Varies. Ages 6 months and up. Cleaning instructions. Mild detergent. Top shelf of dishwasher. Dimensions: L: 5" x W: 5"
I manage an adult day program. I was looking for items for adults. The size was not specified and was much smaller than I thought. It would have been helpful if items could be specified for children or adults...and maybe more items available for adults.